On an Ontario highway late one Sunday afternoon in July 2000, a drunk driver in a pick-up truck smashed into our family van returning from a cottage weekend. 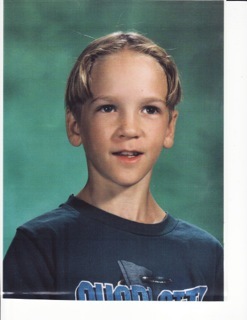 He killed three people – My husband Don Gainer aged 49, my youngest son, Bryan Gainer 11, and himself. Both myself and a family friend suffered major injuries. 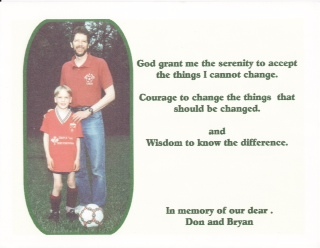 In the years that have followed the loss of my husband and my youngest son, I have battled to reclaim my life. The question that was asked was “Was this tragedy preventable?” Durham, Ontario police investigated allegations that police never responded to a 911 call that warned them a man whose licence was suspended for impaired driving was drunk and getting on a highway. Less than an hour later, the drunk driver who had been arrested just a few days before for drinking and driving, died in a crash along with my husband and youngest son. I know that this crash could have been prevented! 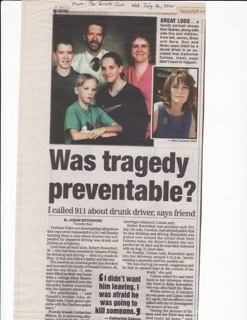 Even before the horrific crash I had been a loyal donor to MADD, Mothers Against Drunk Driving. I used to respond to their appeals because it was an organization I believed in but I never expected to have the connection with it that I have now. 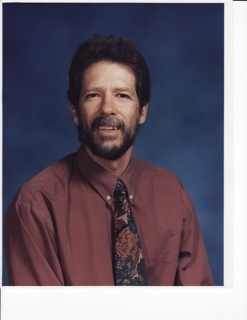 In the Durham Region Chapter of MADD in Ontario, I spoke regularly and often to high school students and other groups for almost 10 years….. Now as part of the Central Okanagan Chapter of MADD Canada, I, although less frequently now, continue to speak to groups that request a speaker from MADD about the dangers of drinking and driving. Although we cannot replace people, we may never know how many lives we will save by persuading people to stop drinking and driving, or getting into a car driven by someone who has been drinking. Laws were changed to recognize a 911 call suspecting an impaired driver as a priority call in the Durham Region of Ontario, (East of Toronto) largely due to the severity of the tragedy itself, and partly because of the media attention surrounding our crash.